It feels good to accomplish goals. Yesterday I accomplished a goal. 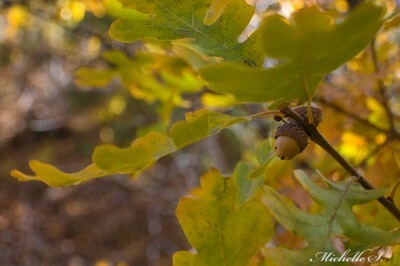 I finally got my first picture approved to be sold on on iStockphoto.com. Even though I have been approved to become a photographer on iStockphoto, I still had to resubmit my photos for approval to be sold (each photo you submit to sell must be approved)...and have had several rejected. But that's ok, because with each rejection, I learn a little bit more about what makes a good, marketable picture. But yesterday I finally got a picture approved. 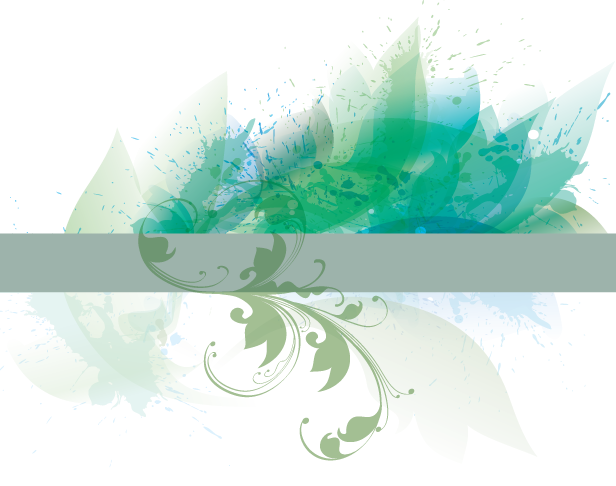 You can view it online here. Honestly, I don't think it's that good, and don't anticipate that it will sell very well. 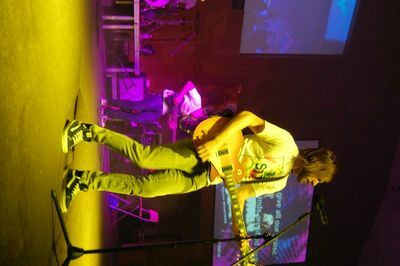 There are like 50,000 other photos on the site similar to mine that are way better. But that's ok...because I finally took a picture well enough to get accepted to sell online. And that was my goal. And so I'm proud. I feel accomplished. Even if nobody buys it. And Happy Halloween...even though I don't like this holiday very much. Lately I feel as though I am rediscovering myself...and perhaps even discovering how much fulfillment is gained through photography. I love photography. I love it more and more each day. I took this picture yesterday in Montezuma, New Mexico near the United World College. UWC is a series of prestigious world wide junior colleges for children of prominent families from all over the world to attend. It's funny because the students are encouraged to not associate with any people from outside of the college. The college in Montezuma has even gone so far as to imply that people in the towns outside the college have diseases!! Weird. Anyway, back to my picture. I was near the UWC taking pictures of the amazing scenery, and several UWC students walked by me on the way to the post office. Some were friendly, smiled, and greeted me. Others avoided eye contact, lowered their voices, and walked on the farthest side of the path. It amused me to see the different reactions of the students as they passed by me. The funny part is that yesterday I was feeling serious effects from the flu that I've been fighting all week. I was sniffling and sneezing like crazy...so maybe I did prove the college right...maybe we DO have diseases!! lol. Hmmm....I don't know. I really like Perspectography BUT someone I know uses the "-ography" suffix on their work...and I didn't realize this until after I came up with the name...So I'm still not sure what name to use. Input? Suggestions??? I suppose for now "Michelle S." will work. a hit and run. Yes. Someone hit our car while we were eating at a restaurant, and took off. Luckily for us, a nice person observed the whole thing, took down their license plate number, and then reported it to us. Fortunately it was just a couple of scratches to the side, and our insurance is currently taking care of the repairs. Not too big of a deal, but POOR CAR!! I think that people LIKE to hit our car or something. That's the third time (to our knowlege) that our car has been hit! What the heck? Maybe our car is bad luck, especially considering the recent incidents that I wrote about with our car a couple of blogs before. Ok, I really don't think our car is bad luck...but still...our car...has issues. really. Sweet Street Fiesta (late night activity) with a Mexican theme. I have no idea why I put up ugly pictures of myself. 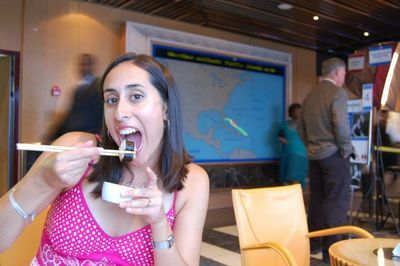 Eating Sushi on the ship...I love sushi but....some of it tasted a little...scary. Waiting for dinner on formal night #2. I bought this dress in Puerto Rico and I LOVE it!!! 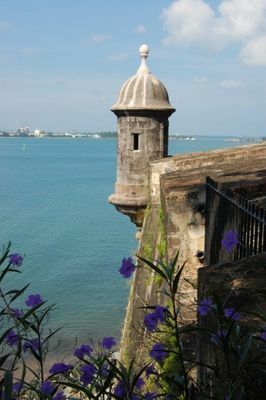 This is a lookout point in Old Town San Juan, Puerto Rico. 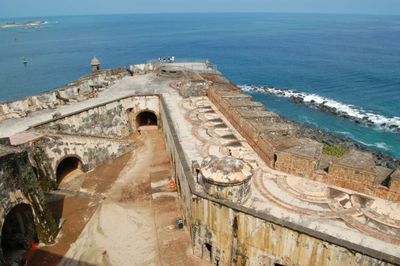 The view from a high point in the Morro Castle in San Juan. 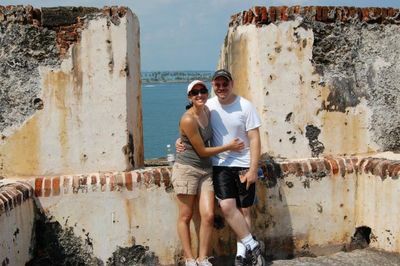 At the Castle in San Juan. 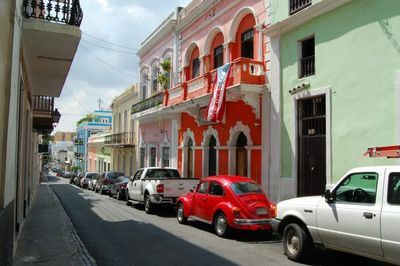 A street in Old Town San Juan. I love the combination of Latin vs. European culture. 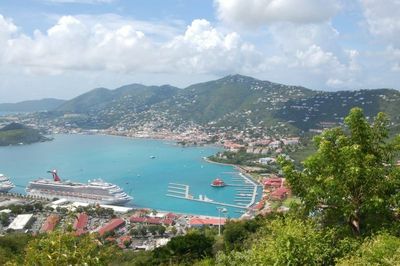 The view of St. Thomas from Paradise Point. 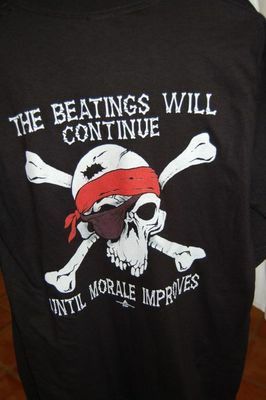 This shirt really amused me, and perhaps I should have bought it. This man had a melt down when he caught me taking a picture of him. He almost threw a piece of fruit at me, and started yelling like a lunatic. I probably would have deleted this picture, but now I have a great story behind it...and learned if you are going to take pictures of locals, either be quick and candid or ask. lol. 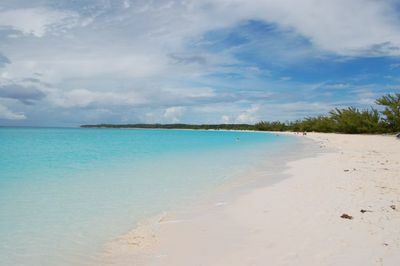 The beach at Grand Cay. 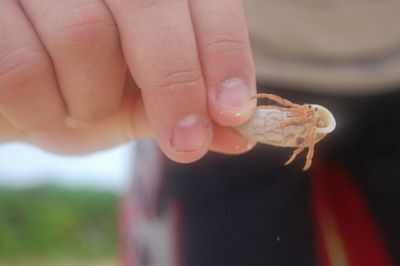 A hermit crab we found on the beach at Grand Turk & Caicos. 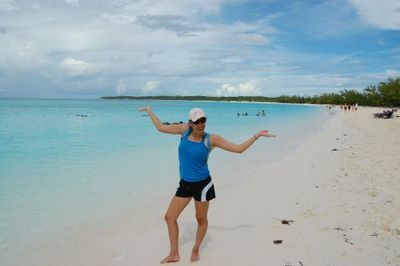 On the beach at Grand Turk & Caicos. 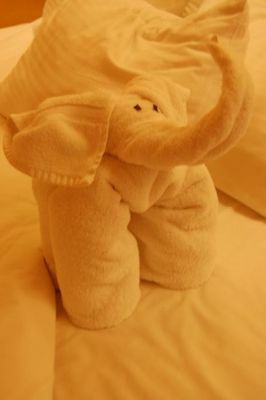 One of the many towel animals our stewards left in our cabin during the cruise. Ok. There you go. I still have plenty more, because I took around 1,000 pictures. Seriously. LOL. 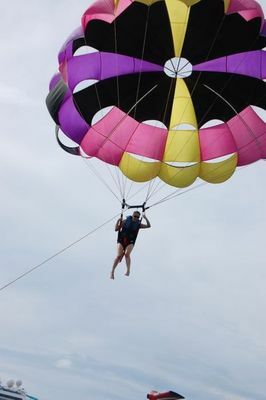 Our parasailing adventure gets a blog of it's own because it was so fun. 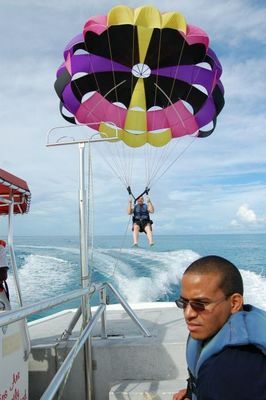 We went parasailing our in Grand Cay (the Bahamas) our second day of the cruise. 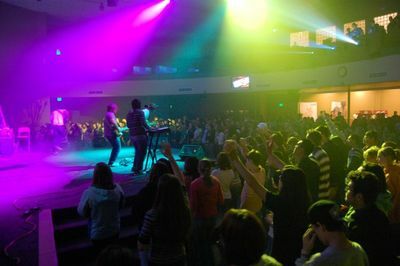 It was seriously so much fun. 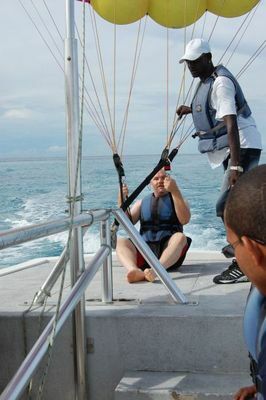 They started out by strapping the parachute to us. Then we sat down on the back of the boat and as soon as the boat is put into gear, the wind gently pulls you up, as the rope is let out. Once you get up into the air, the view is amazing. 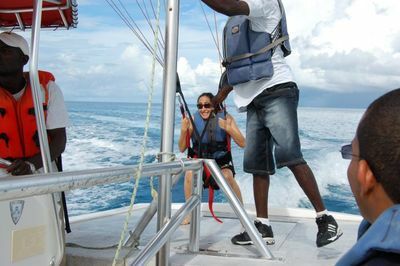 You have a bird's eye view of the Caribbean. There's no noise, and it's absolutely peaceful. When it's time to come back down, they reel in the rope and you slowly get closer and closer to the boat until you're close enough to stand on the back platform of the boat. 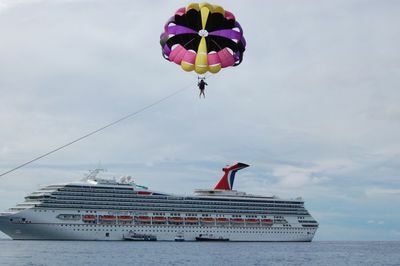 Parasailing is one of the coolest things I've ever done in my life, and I would do it again in a heart beat. I highly recommend it. I'll put more pictures online soon. 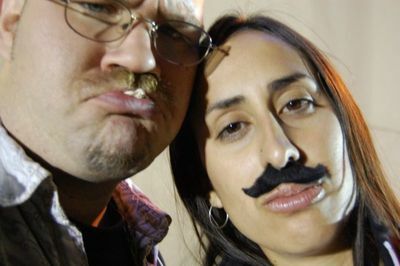 But if you're feeling a little impatient, I finally added our vacation pics to my albums on myspace. There's a whole wealth of pictures on those two sights. so we're finally home. we got home late on saturday night. saturday evening we finally arrived at our home airport, took the shuttle to the off-airport, long term parking to our car. when we reached our car, i opened the front driver's side car door and hit the power lock to unlock the rest of the car...nothing happened...i tried it again. still nothing. oh no. i had a sinking feeling inside of me. i sat in the driver's seat, and looked at the ignition. it was turned to "accessory" (the setting where you can keep the radio on without turning on the car). the sinking feeling became even stronger. i put the key into the ignition, and turned the key. nothing happened. the car battery was obviously dead. i killed our car. somehow when i turned off the car in the long term parking lot, even though i pulled the key out, i didn't turn it off all the way. and so our car stayed on the "accessory" setting for nine days straight. and unfortunately the jumper cables were in our other car at home. how convenient. so after half an hour of flagging down a shuttle bus, and finding jumper cables that weren't fried, we finally got our car started and began our two hour drive home from the airport. after about 20 minutes or so of driving on the interstate, we heard a big "clank" from underneath our car. after i questioned joel about the noise, he dismissed it as a change in the road. we continued driving, and i noticed the car started shaking hard. at that point joel decided that he needed some coffee. we took an exit and pulled into McDonalds. as we were pulling into the parking lot we noticed the car making a lot of thumping noises. joel parked the car and began to check the car. he put his hand on the driver's rear tired and shook it. it moved back and forth with ease. that was a bad thing. then he check underneath the car and discovered that one of the supporting beams to the axle and actually broken off. there was no way we could continue driving home. so we pulled into a well lit parking lot, called joel's parents, turned off the car, and waited an hour and half for them to pick us up. They did and dropped us off at home. yesterday joel, his father, and a friend of the family took a flat bed trailer and drove back out to pick up our car from the Smith's parking lot and bring it home to be repaired. Getting home on saturday proved to be difficult. it's crazy to think how serious the situation was and amazing to realize how much God protected us from a potentially fatal accident. 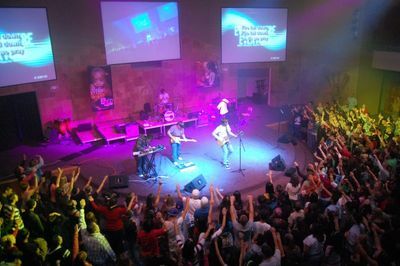 God is so faithful. Our house isn't complete finished being tiled yet, but fortunately the living room is done, and so we can at least set up the entertainment center and the computer. But the tiled floors look so great. Caribbean pictures coming later today! but for now i need go and work out! 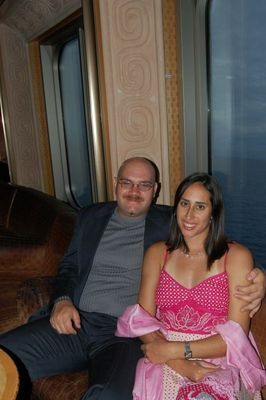 especially after all that food i ate on the cruise. Sandy beaches. turquoise water. perfect beaches. the perfect oasis. 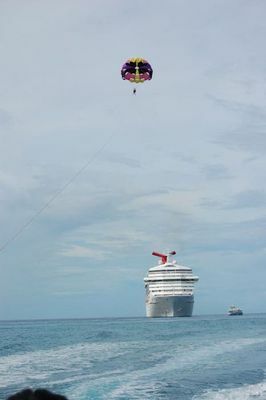 Parasailing in Half Moon was absolutely breath-taking. The view was spectacular. Swimming in the ocean = fun. yes. Snuba in St. Thomas was a blast, and this time I did great. 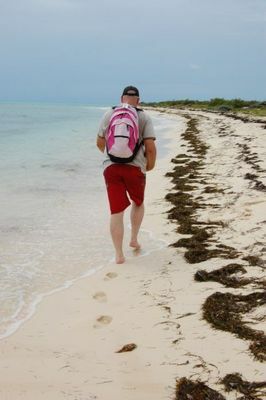 But the colors of the plants and coral were muted and dull compared to Cozumel (we went to Cozumel a couple of years ago). But it was still lots of fun. Took the tram to Paradise Point (one of the highest points on the island) and enjoyed the view. Locals drive on the left side of the road, honk at every passing car, and drive like there's no tomorrow. (just like Latin America) the appearance also resembles some Latin Countries too...but beautiful nonetheless. walked the 99 steps built by the Dutch several hundred years ago. Checked the outside of Blackbeard's castle. 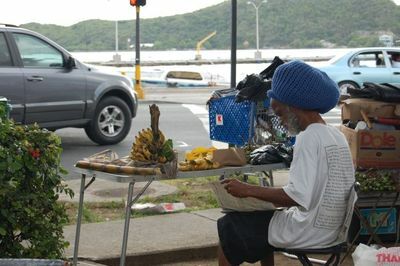 A strange local man almost chunked a piece of fruit at me after he caught me taking his picture. (oops). Convinced taxi drivers to give us half the normal cab fair to and from the ship. checked out El Morro Castille, which is the fort built by the Spanish (I think) on the coast. Very fun. Met a new friend named Tom from the ship on the way. Shopped in Old Town San Juan (historic section). Bought a way cute pink polka dot, spaghetti-strap Puerto Rican style dress. Went to an authentic Puerto Rican restaurant and ordered my meal in Spanish (word). They spoke in English to Joel. FUN FOOD. Walked the beach. Lots of pictures. Serious amounts of shells...all over the place. 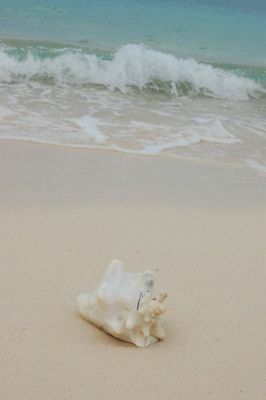 Found a beautiful, nearly flawless, whole conch shell...took it with us, but later returned it after we found out it was illegal to take them (Grand Turk is a state park or something like that). went snorkeling...but quit after fighting the current, strong waves, rocks, and stupid snorkelers who collided with you and then continued on, kicking their fins in you face (I wonder about stupid people). But lots of cool stuff to see. Swam, rode the slide, played miniature golf, met lots of friends, ate at the sushi bar, ate 200,000 meals (last night for dinner I had 2 appetizers, 1 salad, 1 entree, and 3 deserts, plus sushi before dinner as well...just because I CAN!! ), worked out at the gym (had to in order to support my eating habits aboard), went to a yoga class (minus the weird chanting meditation) but it was still a little odd...and really hard to balance while the ship was rocking, dressed formal, took like 1,000 pictures, slept (sleeping on the ship is the best because of the rocking ship), and relaxed. It was way way way fun. And totally needed. 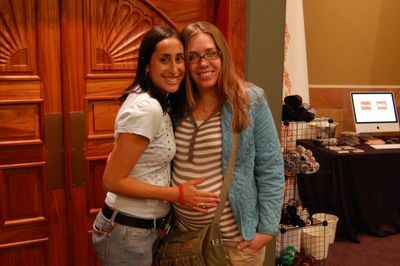 I will put up some of my favorite pictures soon...when I'm not at the airport. And now it's your turn to go on a cruise. Do it.